We offer a comprehensive range of products and services to meet your financial needs. When it comes to retirement planning, a financial professional can provide directions and map strategies that help you on the journey. Our team provides our clients a holistic approach to analyzing their financial needs through planning and investment analysis. 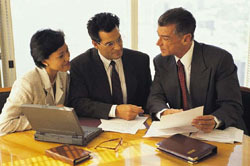 We work with high net worth clients and small business owners to help them address complex estate and business issues. Take control of your Financial Future... prepare yourself for managing risk and taking advantage of potential investment opportunities. To review your financial strategies, please call 727-345-4200 .